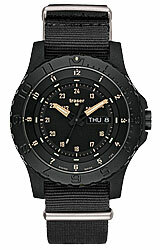 The all new TRASER P6600 Sand Tactical Tritium Collection, model P6600.4AI.3L.01, is the newest addition in the P6600 Type 6 series of military watches. The P6600 Sand is highly stable, shock resistant, highly visible day or night, water resistance and ready for any adventure. 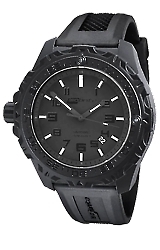 The new P6600 Sand is the latest in a long line of top notch military watches featuring a lightweight double case construction, with an all steel case housed in a lightweight carbon-fiberglass outer shell. This design allows for a true screw down crown and case back, superior water resistance and overall durability. Of course the new Traser P6600 Sand Watch has Traser's famed Trigalight(r) Illumination system, providing the best readability in all lighting situations. 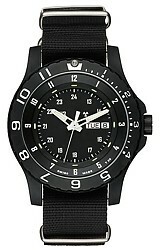 This model features the Black Nato Nylon Band, Solid Black.